A super quick post – I just had to share my very exciting news. Well it won Top Case at CASE-ing the Catty Challenge #16! Thank you so much – It’s been a rough few weeks and this just made my day! It was very humbling to be chosen as there were many awesome entries. My own favourite was the gorgeous card by Elizabeth Gross at Lily Loves Paper – Check it out HERE. Elizabeth also used the Irresistibly Yours Specialty DSP from the SAB catalogue on her card. I love how she has stamped onto the DSP – this is a technique I am definitely going to be trying out! 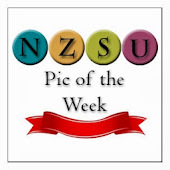 The card was also chosen as one of the pictures of the week at NZSU sites. -Thanks so much!